When you have successfully uploaded a module using the Content Manager, you can add corresponding exam questions. In the menu bar, click on Content Manager. Click the title of the desired program. Place your cursor over the module that corresponds to your question and click the Question Mark icon. Note: By adding the question to the corresponding module, learners who do not pass the exam will be presented with the modules they need to review. Specifically, the modules related to incorrectly answered questions and/or unanswered questions will be presented in a handy overview. Under New Question on the right, click the drop-down list to select from four different question types. Fill in the Blank questions require missing answers, such as words or numbers, to be inserted. 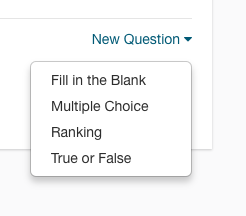 Multiple Choice questions enable users to select one or more answers. Ranking questions allow users to sort answers into a correct sequence. True or False questions enable users to select between correct and incorrect statements. To compile your questions, click Create Mastery Exam in the relevant course. Questions that you created for each individual module will be merged into one final exam.